Perfect view of the snowy garden from the upstairs bathroom, and it looks better now than usual. Those snowy paths are usually (unfortunately) royal blue (scraps of our last pool cover). They definitely look more elegant in a snowy white. The garden layout has really come together at last. The paths are in just the right places at last. The narrow strips around the outer edges are planted with blackberry vines (trained on the fence), peach trees at the far end, and perennials tucked in here and there. 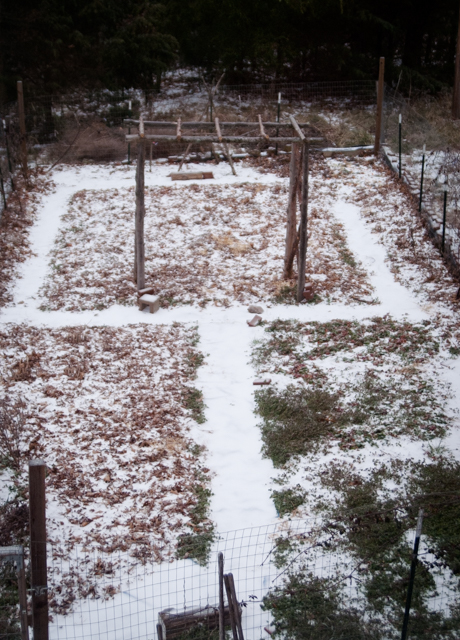 The big square bed is for my okra, tomatoes, and squash (and flowers on the arbor), and the two long rectangles are asparagus and herbs (on the left) and strawberries (on the right). Now all I need is that last frost date. My mind boggles that, in a few months, you will have flourishing flowers and vegies in there, It's beyond my personal experience but I love living it vicariously. Wonderful garden plan. Now we'll need to see an "after" photo in the summer when everything is in bloom. Hope you're not receiving the ice also. We only have about 5 inches of snow now. I'm with Kath. Enough said.